Home Virtualization vs. Cloud Computing: What’s the Difference? Is virtualization right for your business? How about cloud computing? Don’t know the difference? That’s OK — most non-IT folks don’t either. The word “cloud” is often thrown around as an umbrella term, while “virtualization” is often confused with cloud computing. Although the two technologies are similar, they are not interchangeable, and the difference is significant enough to affect your business decisions. Here is a guide to help demystify the tech behind the jargon. In a nutshell, virtualization is software that separates physical infrastructures to create various dedicated resources. It is the fundamental technology that powers cloud computing. The technology behind virtualization is known as a virtual machine monitor (VMM) or virtual manager, which separates compute environments from the actual physical infrastructure. How is virtualization different from cloud computing? Essentially, virtualization differs from cloud computing because virtualization is software that manipulates hardware, while cloud computing refers to a service that results from that manipulation. Most of the confusion occurs because virtualization and cloud computing work together to provide different types of services, as is the case with private clouds. 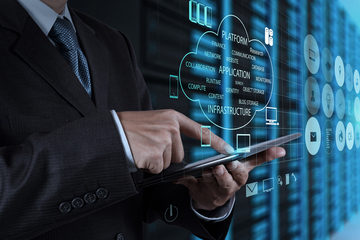 What are the advantages of a virtualized environment over the cloud? To best understand the advantages of virtualization, consider the difference between private and public clouds. A private cloud, in its own virtualized environment, gives users the best of both worlds. It can give users more control and the flexibility of managing their own systems, while providing the consumption benefits of cloud computing, Livesay said. On the other hand, a public cloud is an environment open to many users, built to serve multi-tenanted requirements, Philips said. “There are some risks associated here,” he said, such as having bad neighbors and potential latency in performance. Maximize resources — Virtualization can reduce the number of physical systems you need to acquire, and you can get more value out of the servers. Most traditionally built systems are underutilized. Virtualization allows maximum use of the hardware investment. Multiple systems — With virtualization, you can also run multiple types of applications and even run different operating systems for those applications on the same physical hardware. IT budget integration — When you use virtualization, management, administration and all the attendant requirements of managing your own infrastructure remain a direct cost of your IT operation. How do you know if your business needs a virtualization solution? Determining whether or not virtualization is the best solution for a business requires an in-depth analysis of the organization’s specific needs and requirements. “Some of the items we discuss with customers when they are evaluating private cloud — virtualization — versus cloud computing include who is going to be providing the support and how challenging is integration with other systems,” Livesay said. You should also consider costs — total cost of expenditure (TCO), operational expenditures (OPEX) and capital expenditures (CAPEX) — how much management the business can and want to do, scalability requirements, security needs and how much feature development can be expected, Livesay said. How do businesses know if they should use a true cloud solution? While virtualization is the best solution for some organizations, a cloud solution offers several benefits that are more suitable for other businesses. Outsourced IT — The day-to-day administration, care and feeding of supporting systems move away from you to the service provider. This could free up internal IT resources for higher-value business support and allow you to put IT budget dollars toward efforts that advance your business. Quick setup — Cloud startup is relatively quick and easy. Plus, servers, appliances and software perpetual licenses go away when you use such a service. Pay-as-you-go — An example could be found in Software-as-a-Service (SaaS) applications available today that allow the off-loading of basic IT requirements to cloud service providers. You pay for what you need and use. But you do not have to continue to invest in many of the products used to support the network and systems, such as spam/anti-virus, encryption, data archiving, email services and off-site storage. Scalability — By using the cloud, you can also temporarily scale your IT capacity by off-loading high-demand compute requirements to an outside provider. As a result, as mentioned above, you pay for only what you need and use, only at the time when you need it. Keep in mind, however, that virtualization and cloud services are not end-all, be-all solutions. Like any other technology or service a business adopts, things can always change. What should businesses look for in a virtualization provider? Is it a tried and tested solution? Research the vendor’s track record of product innovation, success and customer adoption. Is there a vision and public roadmap for the solution? You want to understand how the solution will advance and how it will help your business in the long run. What type of ecosystem support exists for the solution? It’s imperative that the vendor work with key business and industry-specific independent software vendors (ISVs), as well as a wide range of resellers, service providers and system integrators. Does the solution support openness and choice? As your business grows, you want the flexibility to evolve your products and processes, and the ability to incorporate other technologies over time. Cloud accounting uptake lower than expected, survey findsIs It Time To Embrace The Cloud?